I just finished Saints Row The Third, which is pretty fantastic and it got me to thinking. 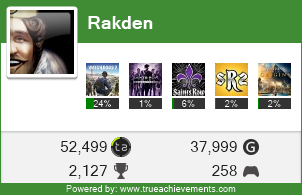 I looked back at my game completions for 2012 and I'm feeling woefully inadequate. Especially when it comes to RPG completions. It's time to revamp my gameplay and start hammering out more games. And I'll document my progress here.